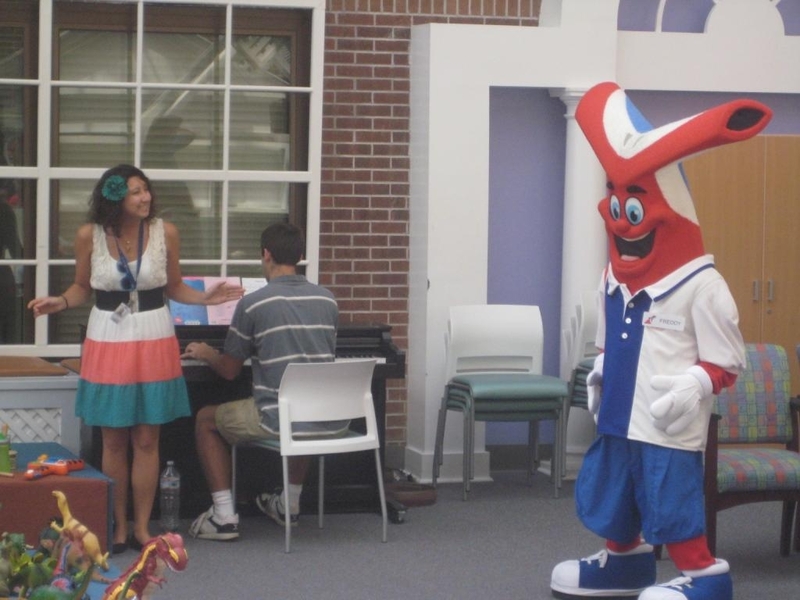 Carnival Cruise Lines’ monthly visit to the Medical University of South Carolina (MUSC) Children’s Hospital in Charleston not only brightened patients’ spirits but also included a donation to the hospital and an appearance by several special guests. The day began with the presentation of a $6,754 check from the South Carolina Stingrays of the East Coast Hockey League, representing funds raised from a season-long sponsorship with Carnival Cruise Lines, which operates a year-round cruise schedule from Charleston aboard the 70,000-ton Carnival Fantasy. Following the presentation, members of Carnival Fantasy’s Fun Force acrobatic team entertained the kids with their high-energy antics while a pianist/singer duo performed several of the kids’ favorite songs. The entertainers, along with Carnival’s “Fun Ship” Freddy mascot and Stingrays’ Cool Ray, posed for photos and handed out colorful leis and other items. Also in attendance were Andy Cook and Tina Berwanger, winners of Carnival’s Race to the Altar contest who were married in a beach-themed wedding following their participation in the Cooper River Bridge Run, an annual 10K race. The Race to the Altar event raised $10,000 for MUSC and Andy and Tina were on hand to present a special commemorative plaque to hospital administrators.